Pedestrian walkway and bicycle path would trek over harbor entrance. MARINA DEL REY—Boaters going in and out of Marina del Rey might soon have a bridge to navigate under, as an architectural firm plans to build a pathway structure across the channel at ocean’s edge. Abramson Teiger Architects released renderings of what the white spiral-themed pedestrian and bicycle bridge, would look like – and the first look of the firm’s plans indicate boaters would easily be able to navigate under the massive structure. The bridge would be at the outer edge of Marina del Rey, where the harbor meets Santa Monica Bay and the Pacific Ocean. 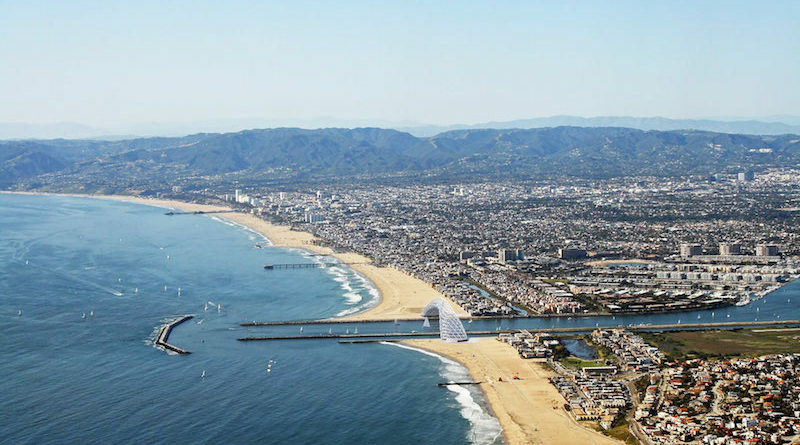 Initial plans state the structure, dubbed “LALA Bridge,” would be 1,760 feet long as it connects Marina del Rey to Playa del Rey. Both ends of the bridge meet on a beach and near waterfront housing. The architectural firm, on its website, explained the bridge would allow a broken pathway to be made whole. “The Harbor in Los Angeles’ Marina del Rey is the largest man-made small craft harbor in the world, which is a valuable resource if you are a boater. Unfortunately for a cyclist or pedestrian, the Marina breaks the existing pathway connecting the North and South route,” the firm stated on its website. “Cyclists and pedestrians who want to experience the Los Angeles urban coastline must make a lengthy detour around the Marina, hindering the quintessential LA experience of cycling or walking along the Santa Monica Bay. To solve this problem, we are proposing a new pedestrian and bike path that bridges over the harbor entrance,” the firm continued. The project team would consist of Trevor Abramson and Michael Lindell. No other details were immediately available as to when it would be completed or how much the bridge would cost to build. News reports indicate the civic process on the bridge is currently nonexistent – the published renderings are merely a discussion starter on behalf of Abramson Teiger Architects. The bridge is supposed going from sand to sand, there are very few bicyclists that ride along the sand, so in addition to the cost of the bridge, we have to pay for a new bike path too? Are you kidding me? Who exactly is going to pay for this? California is already deep in debt and a project like this does absolutely nothing but waste more money. If there is enough interest to fund it privately, fine, but there is no reason to build this. There is already a bike path that crosses down by mariners village there is no reason to waste money building another. This is unnecessary. Not only unsightly, but trash will be thrown into the water, covered in graffiti in a few months and the cost? As a tax payer and boater in MDR, I totally oppose this.